A rare alignment of Pluto and its only known satellite, Charon, in which they take turns eclipsing each other, is giving astronomers new tool to study the solar system's most distant planet. Astronomers from NASA's Jet Propulsion Laboratory, the University of Hawaii, University of Arizona and the University of Texas are observing Charon as it alternately moves in front of and then behind Pluto in rare series of eclipses that occur every 124 years or twice in each orbit of the Sun. Each time Charon passes between Pluto and the Earth portion of the surface of Pluto is blocked from view, resulting in dimming of the combined light from the two bodies. And when Charon moves behind Pluto their roles are reversed. Measurements of the times, durations and changes in brightness of the events will allow astronomers to calculate the masses, diameters and densities of both Pluto and Charon. A more accurate estimate of the density of Pluto and Charon would allow astronomers to develop models of what the planet and satellite are made of. Estimates of Pluto's density now have an uncertainty of 50 percent, which is not accurate enough to derive information on its composition. Pluto's density is thought to be about that of water. That would make it the lowest-density planet known that has solid surface. The new measurements indicate that the combined brightness of Pluto and Charon together diminishes by 4 percent. The dimming lasts about two hours and is superimposed on 30 percent brightness change that occurs over 6.4-day period. The longer change in brightness happens because one hemisphere of Pluto is 30 percent brighter than the other. Very little is known about Pluto and even less about Charon. No one knew, for example, when or even if the five-year-long series of eclipses would begin. (This is the first opportunity to observe the eclipse series since Pluto was discovered in February 1930.) So that they would not miss any of the earliest events, the astronomers established an observing network. 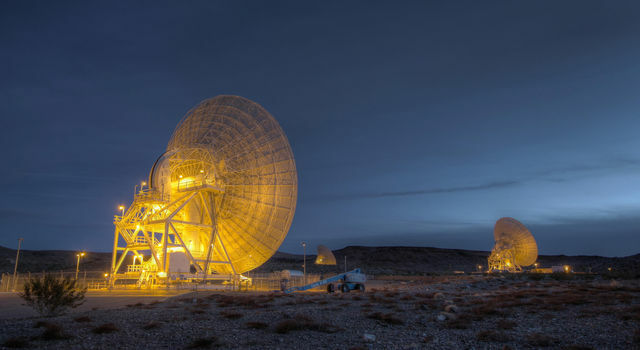 The network is made up of astronomers at McDonald Observatory in Texas, the University of Arizona observatories, Palomar Observatory in California and Mauna Kea Observatory in Hawaii. The first to see and measure an eclipse of Pluto by Charon was Dr. Edward Tedesco of JPL, while observing with Dr. Bonnie Buratti, also of JPL, at Palomar on Jan. 16. On Feb. 17, Richard P. Binzel observed another eclipse from the University of Texas' McDonald Observatory. And Dr. D.J. Tholen observed yet third eclipse on Feb. 20 from the Mauna Kea Observatory. Astronomers discovered Charon, in l978. Charon's orbital motion around Pluto led the astronomers to realize that Pluto is tipped on its side, in much the same way as Uranus, so that Pluto alternately points its north and then its south pole toward the Sun. This release and other NASA information is available electronically through ITT DIALCOM. For access to NASA NEWS, contact Jim Hawley, ITT DIAlCOM sales account manager 98:JIMH or 202/488-0550.